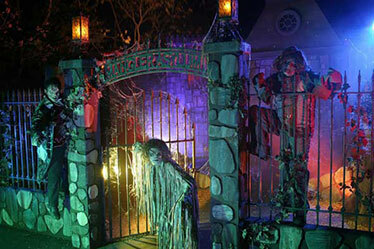 We are designing a new haunt this year. Do we need to consider flame retardant products on our haunt? Does International Fire Shield have flame retardants for our building materials and decorations? How often do your products need to be applied? How long has International Fire Shield been applying flame retardant products and services to the haunt industry? 1.We are designing a new haunt this year. Do we need to consider flame retardant products on our haunt? As part of the design process, haunts are mandated by municipal, state and federal regulations to comply with building and fire codes which specify that all structural and decorative materials be "fire resistant", which may require the application of a fire retardant coating. 2.Does International Fire Shield have flame retardants for our building materials and decorations? International Fire Shield manufactures UL, ULC and ICC classified flame retardant paints and varnishes as well as textile and decorative material coatings that meet code compliance when applied correctly to your haunt. Our products enable designers and haunt builders the freedom of multiple choice when choosing their textile, lumber and decorative material needs for their haunts while economically and quickly meeting building and fire codes. 3.How often do your products need to be applied? Typical haunts have a life span of approximately two years. Unless laundered, our products should last the lifetime of your haunt. 4.How long has International Fire Shield been applying flame retardant products and services to the haunt industry? International Fire Shield has been supplying Class "A", UL Listed, environmentally green, multi-use fire retardants to the haunt industry for over twenty-five years. 5.How do I order your products? Your haunt can e-mail, FAX, or call in any size order. Shipments typically go out of our plant the next day and are sent via UPS or air freight upon request. Allow seven days maximum from order to receipt.